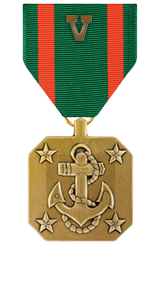 Professional achievement in the superior performance of his duties while serving as Rifleman, 1st Squad, 1st Platoon, Company I, 3d Battalion, 3d Marines, Regimental Combat Team-7, I Marine Expeditionary Force Forward, on 5 May 2006, in support of Operation IRAQI FREEDOM. While on a joint security patrol with seven Marines and eight Iraqi Army soldiers, Lance Corporal Bissell’s squad was attacked by an improvised explosive device and small arms fire. Lance Corporal Bissell was struck in the helmet by a piece of shrapnel which nearly knocked him unconscious. He quickly regained his composure and established positive identification of two individuals in a building across the river holding a spotting scope and a cordless telephone and attempting to detonate a secondary improvised explosive device. Without hesitation, Lance Corporal Bissell engaged with three rounds, mortally wounding the triggerman. Lance Corporal Bissell’s rapid, courageous actions likely saved the lives of the Marines and Iraqi soldiers in his squad. Lance Corporal Bissell’s initiative, perseverance, and total dedication to duty reflected credit upon him and were in keeping with the highest traditions of the Marine Corps and The United States Naval Service.